The United Kingdom (UK) Government has criticised the John Mahama government for overseeing the importation of rice, tomato, poultry and vegetable among others, instead of building a vibrant and dynamic agriculture for the production of the products locally. 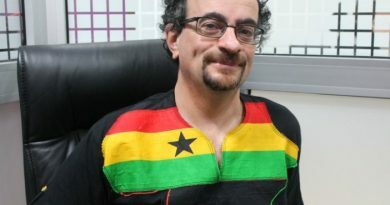 The British High Commissioner to Ghana, Mr. Jon Benjamin, who tasked the government to reduce its wage bill on rice, tomato and vegetable importation, also raised alarm over the untapped agriculture potentials found in Northern Ghana and challenged the government to overturn the situation. According to the British High Commissioner, the North of Ghana has a large number of subsistence farmers, who could be empowered to go into large-scale farming to earn more income to cater for their families and improve the national economy. Speaking at the official launch of the UK government’s Department of International Development (DFID) initiated five (5) year pro-poor agricultural programme dubbed -“Market Development (MADE) programme in Tamale, Mr. Jon Benjamin announced a whopping 14.3 million pounds investment into the MADE programme by his government. He said the intervention formed part of the UK government’s commitment to unlock agribusiness and investment opportunities in 63 districts within the Northern Savannah Ecological zone where poverty was endemic. The programme was also designed to improve market interactions between the main players in the agricultural value chain such as the producers, the farmers, buyers, financial institutions, the entrepreneurs and the service providers among others. The UK High Commissioner maintained that with the MADE programme market systems in Northern Ghana would be improved to meet international standards as means of improving rural livelihood. He said that since its establishment in 2014, the programme had managed to attract private sector seed and input dealer companies into the Northern Savannah Ecological zone who were into partnership with over 10,000 smallholder farmers and aggregators MADE has been working with. It is expected to end in 2018 for a possible second phase based on the success of the first phase. Deputy Minister of Food and Agriculture in-charge of crops, Dr. Ahmed YakubuAlhassan commended the UK government for the intervention, which he said would complement Ghana government’s agriculture interventions to enhance the living conditions of the farmers. Dr. Alhassan, however, said alleviating poverty and ensuring food security in northern Ghana did not lie in handouts, but rather on carefully designed investment in agribusiness.